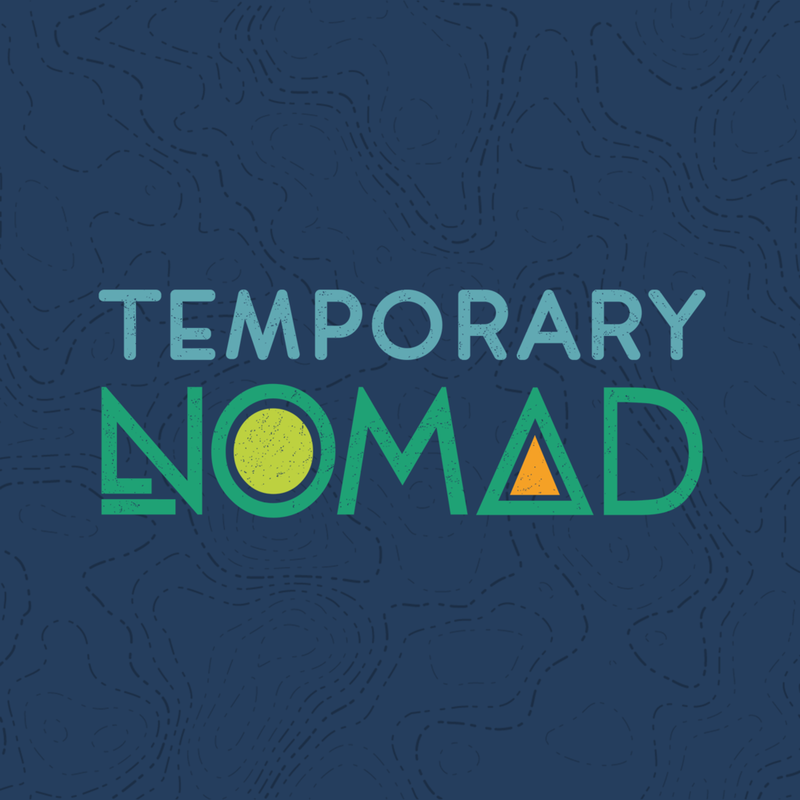 Temporary Nomad is an interactive guide for adventurer’s planning a road trip on a budget. 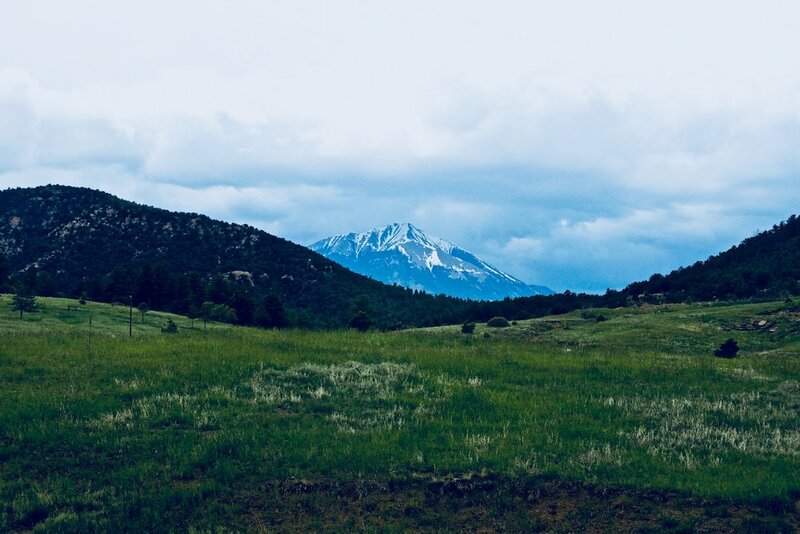 With the goal of connecting everyone to the outdoors however, whenever, and wherever possible, Temporary Nomad acts as a resource to help plan your next adventure, no matter how big or small. As members of the Interactive Media Masters Program, students are tasked with creating an original, fully functional interactive media capstone project of their choosing. Students spend the fall semester developing a sophisticated theoretical understanding of concepts relevant to their chosen capstone topic. This provides a foundation for the capstone project that students work on throughout their spring semester. Fueled by my love for the outdoors, I chose to focus on the intersection of nature and technology, more specifically how new media can be used to positively facilitate outdoor experiences. 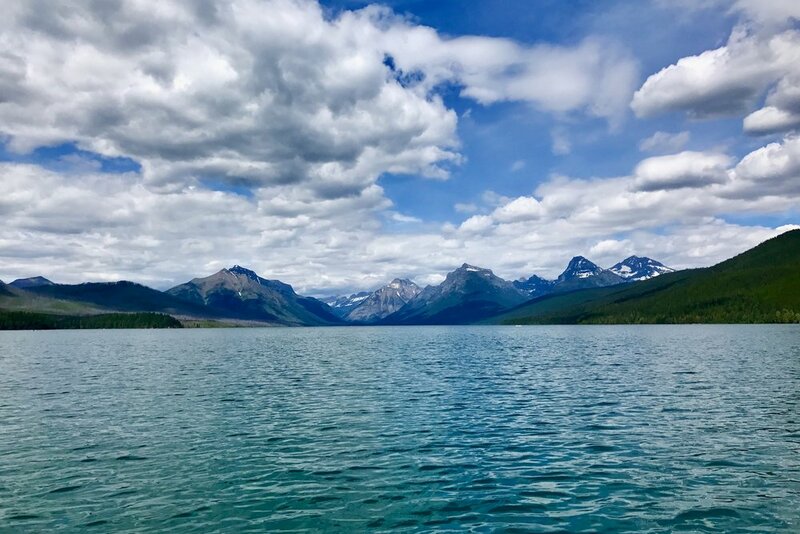 I explored the ways in which new media can be used to promote pro-environmental actions, enhance educational experiences outdoors, and bring people together for recreational opportunities. Using the research I gathered during the fall semester as a foundation, I began the process of identifying what exactly my capstone project would be. The goal of my project was to explore the relationship between technology and the outdoors, more specifically how various forms of technology can be used to inspire, motivate, and facilitate outdoor experiences. I decided I wanted to focus on how technology can be used as a point of entry into the outdoors to facilitate positive experiences. What is the overall purpose of this project? To inform? Entertain? Inspire? Foster a community? Are there multiple purposes? 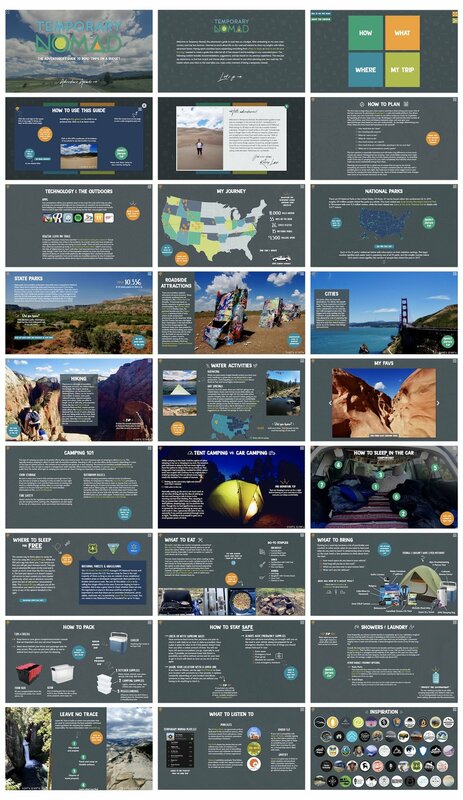 After many ideas, I decided on creating an interactive guide about cross country road trips. 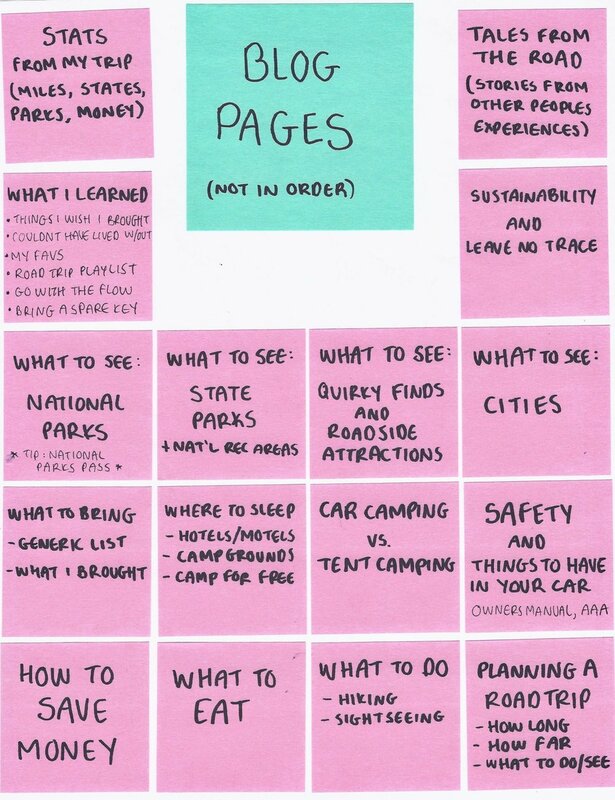 Utilizing my own cross country road trip experience as a starting point, I began brainstorming possible content to include. This helped me to define the content areas on my site. I then used card sorting to determine the information architecture of the site. My goal was to create an information architecture that would make for an intuitive and enjoyable user experience. By visualizing the information architecture of my site, I was able to conceptualize the flow of my content. Arguably the most important part of my interactive guide experience would be the creation of some sort of navigation system. This navigation needed to act as a homepage of sorts where users would be able to select the content they wanted to view. After identifying my primary content pages, I began sketching out a grid for my navigation page. I needed something that would provide a link to all of my content pages without being overwhelming and confusing. I sought feedback from my peers on this first iteration, which helped to identify what was successful and what wasn’t. A major takeaway was that they liked the look of the page but were overwhelmed by the options and didn’t know where to begin. 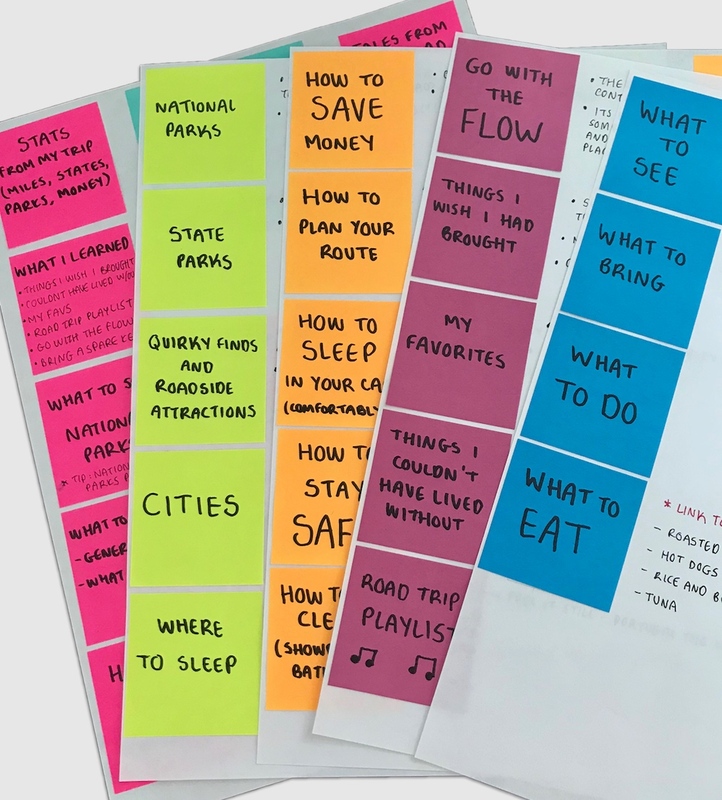 I then went back to the drawing board to re-conceptualize how my content would be organized, ultimately deciding on grouping my content into four different categories: What, How, Where, and My Trip. 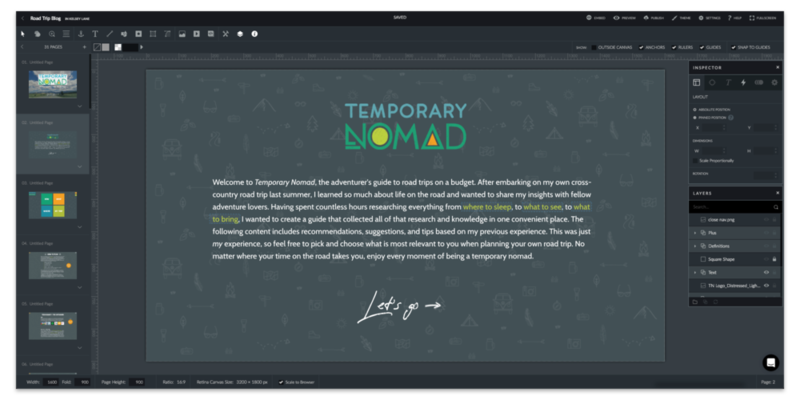 All of the content that I included in the Temporary Nomad guide is my own. The photos and videos are from my own road trip that I went on during the summer before I started graduate school. I used Photoshop to edit my photos, Illustrator to experiment with layout and create a logo and brand guide, and Premiere to edit video content. To create the guide itself, I used Ceros, an experiential content creation platform that empowers designers to create engaging, interactive, and immersive content experiences without traditional development or code. 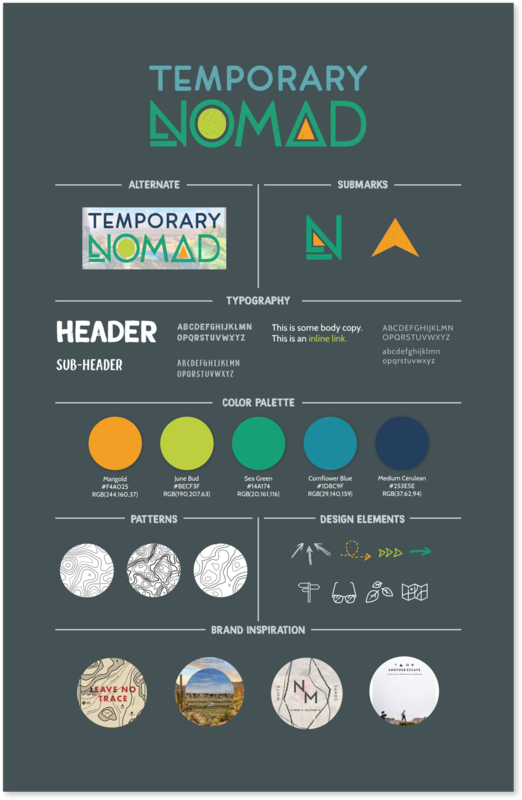 Users can download resources from the Temporary Nomad Guide to help plan and document their own adventures. 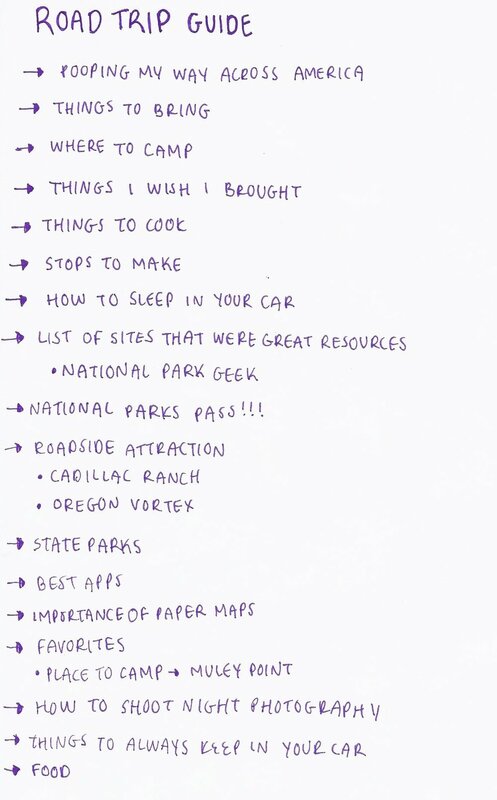 This National Parks Checklist allows you to keep track of the parks you have visited so far. 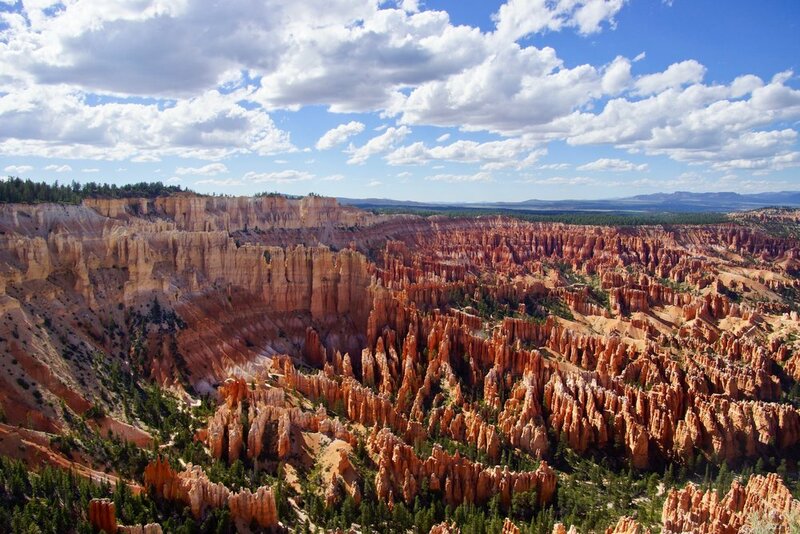 The Dyrt published this article featuring Temporary Nomad and my cross country road trip!